It's Written on the Wall: Get this FREE Christmas/Holiday Planner! You've Never Been So Organized! Get this FREE Christmas/Holiday Planner! You've Never Been So Organized! Things always run smoother when there is some kind of planning involved. With this Christmas planner you'll never have to ask yourself these questions.....Where did I put that present? Do I already have that ingredient in my pantry? Where is my party invitation list......Did I send them a Christmas card this year? You'll never need to guess again. You'll have it all in hand with the Christmas planner. You pick and choose which pages are pertinent to your situation and just download and print. Here are two of the designs that go on the outside of your binder. There's even a spine insert that matches each cover for your book....Cute stuff. 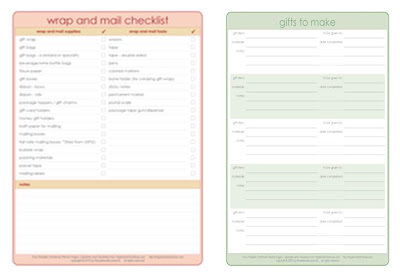 13) Holiday menu planner and many more to choose from including blank pages and calendar pages that go into 2012. You customize your book to meet only your needs. It's so easy and you will feel so GREAT knowing that you have a handle on the holidays! Some of the pages could even be used for your Thanksgiving planning. So Let's get Organized and make the holidays even more Happy. Click Here to go to the master list page and get everything you need. Happy Holidays!